A favorite view in The Park, across fountains. 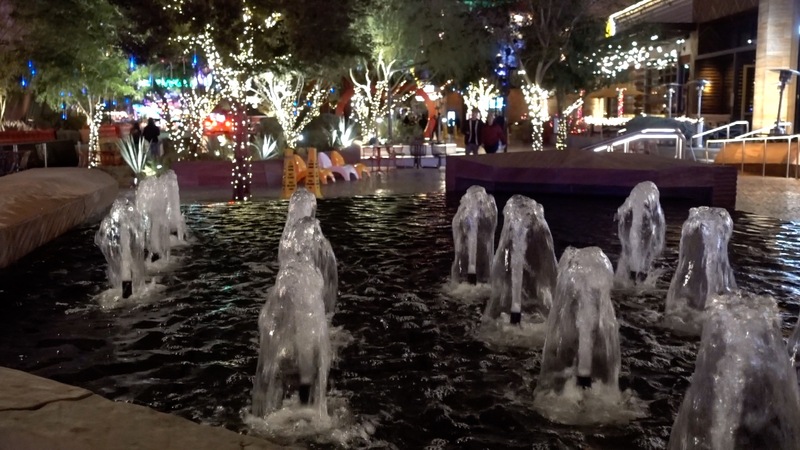 A week ago, on a slow Thursday night, I parked at the Tropicana Las Vegas and walked to The Park Vegas, the area between New York New York and Park MGM (formerly the Monte Carlo) leading to the T-Mobile arena. I made the trip to check out what I had heard were holiday decorations at The Park. Along the way I tripped over a curb, (some nice folks helped me back to my feet) and I saw several homeless folks looking for contributions. One of the homeless men was cradling a very young girl, maybe two years old. A woman was talking to the man and suggesting several shelters he could visit, but the man seemed adamant he would stay where he was. Truly a sad scene. But the night brightened as I made it to The Park Vegas. The lights on the waterfalls and the flower-like shade structures were spectacular. I took a short video, in case readers have not visited The Park. 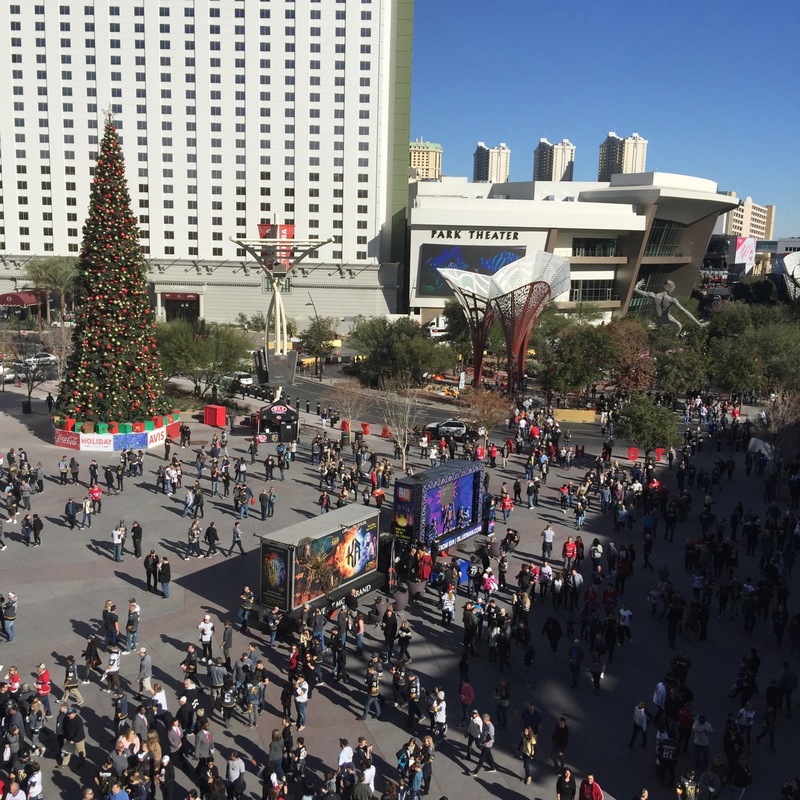 Looking at the west end of The Park as the crowds surge into the T-Mobile arena. A couple days later, a friend invited me as her guest to a Golden Knights hockey game played at the T-Mobile arena. Suddenly, lots of people were in The Park area, and the arena was loud. 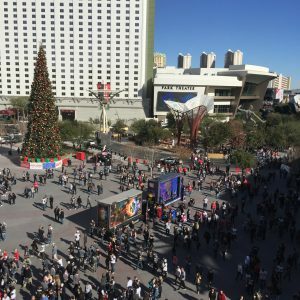 My friend loves Golden Knights hockey games and the 20,000-seat arena was rocking with fans, every one of them seeming to vie for space on the overhead video screens. (Because a number of the excited folks wore rather unusual headgear, I was reminded of “Let’s Make a Deal”.) I have to admit, the entertainment before the game and during the lulls was … entertaining. The hockey itself — well, it was fast, but I learned to look at the bunches of players near the net and then listen to the cheers to learn that a goal had been scored. Fortunately, slow-motion replays helped. So that’s my story. I loved the park and found the hockey… interesting. I’ve enjoyed the ambience in the Park ever since it opened, but I didn’t know about the holiday decorations. I visited The Park last Christmas season but I don’t remember the colored waterfalls. Is that “new and temporary “? Gorgeous video! Looking forward to visiting this new (to me) park. Wouldn’t have known it was there except for your captivating visuals!